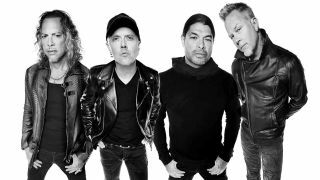 Metallica drummer Lars Ulrich says he wants the band to keep touring and recording until their bodies give out. And even when that day arrives, he believes they’d still have the mental capacity to keep going. The thrash icons will release long-awaited 10th album Hardwired… To Self Destruct on November 18, to be followed by extensive touring in 2017. Comparing his hopes of longevity with the Rolling Stones’ career, he says: “I love the Stones more than anybody else on this planet. What we do, I’d like to argue, is slightly more physically demanding in terms of the energy that goes into it. “Songs like Battery, Master Of Puppets or One have this insane physical energy and demand. If you can’t play it at the demand it deserves, it’s better not to play it. And despite the global downturn in album sales, Ulrich doesn’t plan to stop recording. “I hope we go on making records until the day we fall over,” he says. “That’s what inspires you and gives you a sense of still being in the game. I respect peers of ours that feel different. Earlier this month Metallica released Hardwired, the lead track from the album, offering a hint of what the double-disc release will contain. Ulrich reports: “I think maybe this one is a little punkier in places and maybe slightly less progressive. It’s about the riffs, and a bit more groove-oriented.